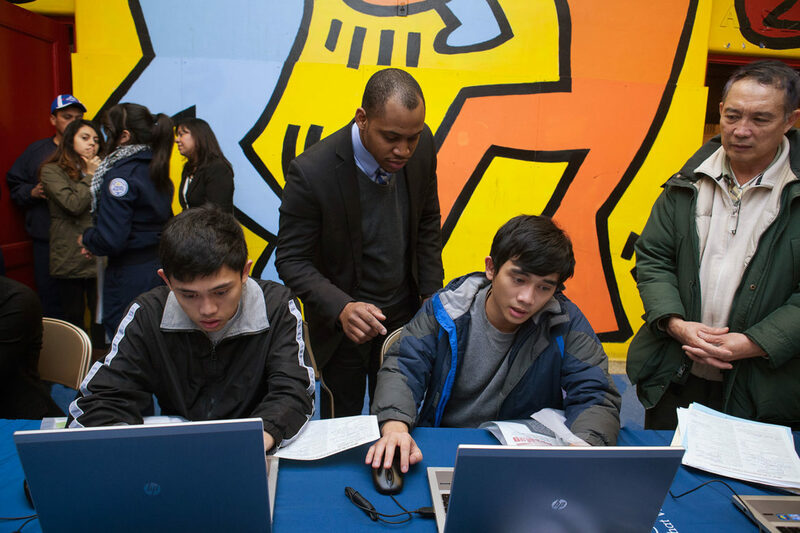 Two students register for the Star Scholarship at Wells Community Academy High School with the help of Michael Jones of City Colleges of Chicago at a December 2014 information session. When city and school officials launched the Chicago Star Scholarship program back in 2014, they promised a free two-year college education to public school graduates who qualified for college but otherwise wouldn’t be able to pay for it. Every Chicago Public Schools graduate who met the academic criteria would get free tuition, fees and books from City Colleges of Chicago. And unlike most of the growing number of free community college programs nationwide, Mayor Rahm Emanuel deliberately opened the Star Scholarship to undocumented students. Graduates of Chicago’s private schools will now also be eligible, following a recent City Council vote. The Chicago Reporter obtained data from the first year of the program, which shows that more than half of the first group of Star Scholars — 647 of 1,139 students —did not receive the free ride because federal and state financial aid already covered their costs The Star Scholarship is a “last-dollar” scholarship, which means City Colleges only kicks in tuition costs for students who don’t get financial aid. Among the remaining 492 students who did receive the free ride, close to 56 percent were undocumented immigrants. Few undocumented youth in Illinois end up attending college at all because they’re ineligible federal and state financial aid. “Boy, this has given so many of our students the opportunity to go to college when they wouldn’t be able to otherwise,” said Alan Mather, chief of college and career success for CPS. Less than 5 percent of Chicago public high school students are likely undocumented. Among the undocumented Star Scholars: Azalia Martinez, a 2015 Jones College Prep graduate who is now studying public health and social work at Daley College. Martinez said she “felt a sense of relief” when she got the scholarship. “I knew that my parents and I wouldn’t have to worry about paying for college the [first two years],” said Martinez, who is now saving up to transfer to a four-year university. The high number of undocumented students may change the national conversation around free community college programs, said Sara Goldrick-Rab, a professor of higher education policy and sociology at Temple University in Philadelphia. The state’s higher education funding crisis, combined with what counselors describe as a growing aversion to debt, is pushing students from all economic backgrounds to start at a community college. The Star Scholarship “has definitely become a big conversation and option for our kids,” said Karen Devine, lead counselor at Taft High School, which had 61 Star Scholars. More than a third did not qualify for financial aid because of family income. The high numbers of undocumented and more middle-class students helps explain why the first year’s price tag was 50 percent more than expected: $3.3 million compared to an anticipated $2 million. All 1,139 participants will get other benefits, including extra counseling and support to transfer to one of the 15 four-year universities that have agreed to take on Star Scholars who transfer from City Colleges. Charts: Latino students disproportionately benefited from the City Colleges of Chicago’s Star Scholarship, including many who are undocumented. Data from City Colleges of Chicago. Undocumented students are counted as those who filed a special alternative financial aid form instead of the traditional Free Application for Federal Student Aid (FAFSA), which is off limits to undocumented immigrants. Sickening. Absolutely sickening and should be required reading for every citizen.